Since I have been researching my family’s history, I have learned about what their occupation was, who they married, the children they had. One thing that I haven’t learned a whole lot about is the hobbies they kept. A hobby, according to Oxford’s dictionary, “is an activity that is done in one’s leisure time for pleasure” (Oxford, 2014). Obviously, genealogy is one of my hobbies. But, I also enjoy camping and reading in my spare time. When my Aunt Viv and I went visiting old family residences in Chicago, I learned that my great-grandfather, Peter Kersten, made his own wine and beer at home. He worked as a Master Brewer for Keely’s Brewery, but he also did so as a hobby. Additionally, Viv told me that he had a wonderful garden in the back. My mother has shared with me that her grandfather, Thomas Irving Sublett also gardened. I know that my grandfather, Lacy Luke Sublett, enjoyed fishing. My father enjoyed painting when he was younger. My grandmother, Virginia Odelle Moss Sublett, did not pick up a paint brush until her 70’s but she had a talent within that our family takes pride in these paintings. They hang on the walls of our home in several different states! I know some of my family members were part of civic organizations during their lifetime. For example, John Thomas Sublett, was a member of the Independent Order of Odd Fellows. My father was in the Kiwanis Organization when we were younger. For all those that read this blog, tell me what hobbies you enjoy? What hobbies can you remember from our ancestors? What other civic organizations do you remember our ancestors being apart of? Happy New Year everybody. I hope yours is getting of to a great start. As a start another year of my genealogy, I am reminded of the roadblocks, obstacles and other adventures one faces while research the past. I am so glad you have chosen to explore backwards with me. Please feel free to make comments, suggestions or give me additional facts. Here is the story of Obadiah. Obadiah Stevens was my third great-grandfather. His name was spelled Obediah and Obadiah on various documents, so it is unclear as to which was accurate. I really like that name. It is a name of substance. It is a biblical name, meaning servant to God. Obadiah was born 7 May 1809 in Oglethorpe County, Georgia. He was the eldest of ten children. 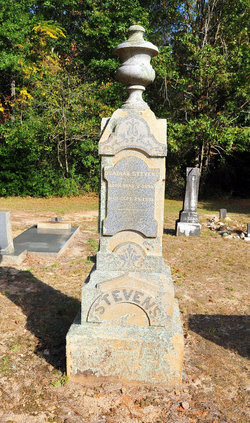 His parents Joseph and Martha Carter Stevens raised their children in Oglethorpe County. I thought for a long time that he had later became the Commissioner of Agriculture for Georgia. However, as genealogy goes, you really have to scrutinize the person. Therefore, needless to say, I did a lot of research on a relative that was not mine. It is a good lesson though. Regardless, I have an electronic book that I found on Google entitled Georgia: Historical and Industrial that I thought was written by him in 1901. It still has some very interesting tidbits. The book was written in response to the growing demands of resources and possibilities available in Georgia (Stevens & Wright, 1901). The book is very lengthy, but one of the things I learned was that James Edward Oglethorpe was sent from England to manage a colony that was to be a refuge for the “poor and other persecuted sects” (Stevens & Wright, 1901, p. 15). Georgia was named after King Georgia. This colony was planned as a model colony, one that prohibited both slavery and rum. John and Charles Wesley (founders of the Methodist Church) were among the inhabitants of this new colony. While Oglethorpe remained in Georgia, liquor and slavery were prohibited. Oglethorpe returned to England in 1743 and a few short years later the laws regarding liquor and slavery were abolished (Stevens & Wright, 1901). Obadiah married Martha “Patsy” Watkins on 18 July 1832 in Oglethorpe County. Obadiah was 23 years old and Martha was 17. They owned several hundred acres on Grove Creek. In The Stevens Family book, written by Claude Gibson Stevens in 1973, Claude inserted a letter from Obadiah to his wife when he went to visit his second son, Walter W. Stevens at the front line of the Civil War. This is interesting on several fronts. First, I have never heard of anyone “visiting” someone while he was a soldier in the war. Second, aside from giving an account of the wounded and injured, he asks to have his low grounds worked and his hogs kept in the pasture (Stevens, 1973). Obadiah was a slave owner, like most of the landowners of the time. According to the 1850, Slave Schedule, he had 15 slaves. However, if you look closer at the records, about 10 of them were under 15 years old (“United States Census (Slave Schedule), 1850,” index and images, FamilySearch (https://familysearch.org/pal:/MM9.3.1/TH-266-12880-33218-98?cc=1420440&wc=6145828: accessed 01 Jan 2014), Georgia > Oglethorpe > image 50 of 95). Obadiah and Patsy had three sons: Joseph Reese Stevens, William Walter Stevens and Columbus Augustus “Gus” Stevens. All three sons, fought for the Confederacy. Walter did not survive the Civil War. According to the Steven’s book, he died as a result of injuries suffered (Stevens, 1973). I do not know about you, but I find it extremely gratifying to place my ancestors in their historical context. It helps me know more about them.